When Vessel first caught my eye some months ago, I dismissed it. What a mistake. Sarah Beth Durst captured what I love most about fantasy with her impressive command of prose, instantly likable main character, and beautifully defined world. I had a hard time tearing myself away to do normal things, like I don't know, eat and sleep and other silly things like that. I was so firmly rooted in the story that my soul wept knowing that there wasn't a sequel. Vessel was just that amazing. On the day she was to die, Liyana walked out of her family's tent to see the dawn. Sarah Beth Durst carries the story along with a beautifully exotic, yet easy to understand writing style. It's straightforward and reminds me of Maria V. Snyder's style -- how the sentences are short, but not truncated. It complements the characters and plot well by enhancing the atmosphere rather than getting in the way. Durst also shows a command of story. When Liyana is abandoned by her tribe, Durst is able to maintain interest even when Liyana isn't interacting with another character. I was expecting a slump, because it's typical to see a character's inner self displayed by how they react to others, but there was plenty of conflict, both internal and external. It was at that point that my interest in Vessel doubled. It only got better the deeper into the story I got. And not only story, but world. The world-building was incredible. Complex, yet easy to understand, the stakes were clearly defined and I felt, right along with the characters, the dread of what could happen if the worst occurred. I loved the extra details: the stories, the gods, the destinies. All these fun things that don't really happen outside of a fantasy novel. Liyana was a stellar character. (In fact, all the characters were very defined, with character specific dialogue.) 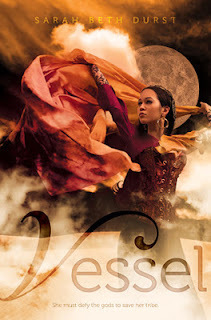 I loved Liyana from page one, and felt immense sympathy for her when her tribe left her -- which occurred within the first few chapters, generally too soon for me to form an attachment to a character. Also, I never grew irritated with her because it seemed that all of her actions were well-defined by a clear thought process alongside consistent and believable motivations. She was feisty and a quick thinker. Possibly one of my new favorite characters. Out of everything that made this novel unique to me, the romance stuck out the most. When Sarah Beth Durst described, in an interview with Simon & Schuster, how the romance in her novel was very natural, I didn't quite believe her. Now, after having experienced Vessel for myself, I realize how right she was. It didn't feel superficial to me; there was no instant gratification. And overall, the romance was intensely bittersweet, but it built and progressed at a natural pace. It's amazing to me that Durst could tie up an entire story within four hundred pages. It's strange to me to see a stand alone fantasy book, and it made me sad to let go of the story so quickly! While some of the action scenes could've been refined to show more depth and clarity, the plot progressed smoothly and built the stakes higher and higher until my fingers were clenched around the book in anticipation for the conclusion. Vessel was an amazing story. I must have it for my shelves. Wow, I'm sold! This is a stunning review and I'll definitely pick this up soon. Everything from Liyanna to the romance sounds like something I'd enjoy so I hope I love it as much as you did. Thanks for your thoughts! I haven't really heard much about this book - clearly I haven't been visiting the right blogs. ;) It sounds fantastic! I'm pretty sure this is my sort of read, and you also have me at the mention of a bittersweet and realistic romance. I haven't read anything by Sarah and I only heard of this book now. But really, this sounds interesting. There's nothing I love about romance than one that is "very natural." Thanks for putting this on my radar, Amelia! Hey Stephanie! Thank you so much for the praise. I hope you absolutely love this book, too. :) Happy reading! Oh my gosh, congrats! I'm so jealous -- I really want my own copy. :3 Thanks for stopping by & happy reading! I hope you get to read this and see for yourself how amazing it is! :) Happy reading!